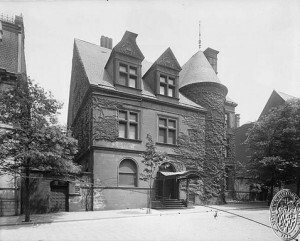 One of a few–and possibly the only fully intact late-nineteenth-century urban mansions designed almost exclusively by acclaimed by New York architect, Standford White of McKim, Mead & White, the Ross Winans House at 1217 St. Paul Street is the epitome of cosmopolitan living in Baltimore. 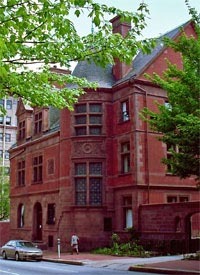 Commissioned by Baltimore millionaire Ross R. Winans, heir to a fortune made by his father in St. Petersburg, Russia, the 46-room, brick and brownstone French Renaissance revival style mansion was built in 1882. The house features fine oak paneling, parquet, leaded glass, Tiffany designed tile and other fine materials throughout. Image courtesy the Maryland Historical Society. 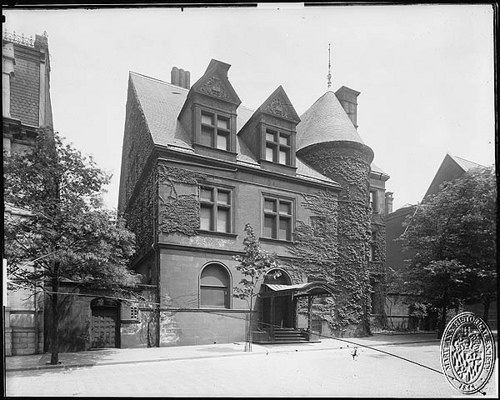 The Winans Mansion has remained a dominant architectural symbol of the neighborhood and has been used as a preparatory school for girls, a funeral parlor, and a doctors’ offices. Baltimore Heritage identified the building as a threatened landmark in 2000, after it sat unoccupied for many years. Shortly thereafter, Agora Inc. took control of the building and in 2005 completed a multi-million dollar historic renovation that gained distinction by winning a Baltimore Heritage preservation honor award that year. Agora continues to own the building and uses it as offices.